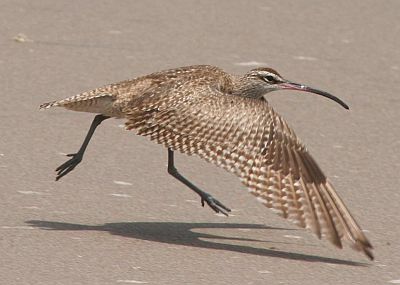 Whimbrel Numenius phaeopus, photographed by Juan Pedro Paz-Soldán. Numenius contains the curlews and whimbrels, relatively large shorebirds with long, strongly downcurved bills. The whimbrel Numenius phaeopus, bristle-thighed curlew N. tahitiensis and slender-billed curlew N. tenuirostris have the bill straighter at the base than other species, with a sharper down-curve towards the end; the remaining species have the entire bill more evenly curved. Characters (from Ridgway 1887): Bill decidedly arched or decurved; wings at least 200 mm long; back of tarsus covered with small hexagonal scales. Ridgway, R. 1887. A Manual of North American Birds. J. B. Lippincott Company: Philadelphia. [S66] Sclater, P. L. 1866. Remarks on recent additions to the Society's menagerie. Proceedings of the Zoological Society of London 1866: 203.